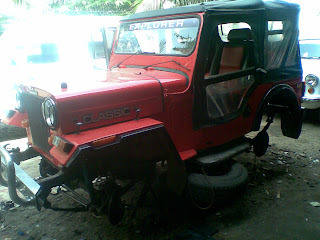 After many successful OTRs and Rescue operations during the last flood that happen in Velachery, Chennai due to the rain the Jeep was crying for attention. I really thank to my jeep for saving us during the last rainfall, our house was flooded with 5 and half foot water and the only vehicle to take us out from the flood is the Mahindra Classic. It did really heroic action during the critical time. Right from water mixed oil in the differential to broke components under body, I decided to address all of them at one stretch. So my future offroad plans will not have any interruption at the last minute. 3. Break career plate, cylinders, oil, disc break pads & caliper, drum break shoes and converter TC valve all required to be changed. 5. In addition few engine related items such as shields and valve door washers are also required attention. Hence we decided to change them all including king pin bearings and few other components. I hope to see the music system will have a change too in the Jeep. 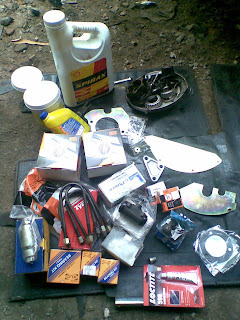 My mechanic's team is fully aware of the importance that I have in my jeep hence they do have careful lookout of individual components for any attention that is required. I'm guessing the jeep will be delivered in a day or two before I make my debut drive after service. hi . . I am an anxious buyer who is buying a mahindra classic jeep 1987 model. It was used by the army hospital until 2003 when the present owner bought it and modified it. By modification I mean he changed some of the components of the jeep. I don't exactly know to what extent he modified it, but from the first inspection of the car it looked well maintained. He has changed the transmission wires jutting out of the engine. 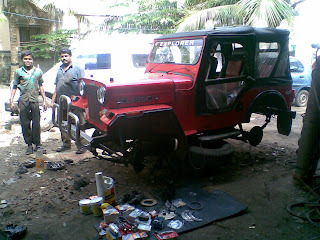 He also changed the tyres which used to be the standard tyre for Scorpio back in 2004. He also did the paint job and colored it pitch black. I paid him an advnce of 15000 rupees. He quotes 80k. I have committed to buying it. But On a hind sight, do you think I made a mistake? I would like to thank you for the information given with photos. Congrats for having such a fantastic Explorer. I just want to know...how much you spent to bring to this shape and condition from the first photo which you posted. I mean when you found the jeep in the not used condition. Why I am asking this is, if I buy a military second hand jeep. How much i have to spend. I'm sorry i can't post the actual expenses as it differs now.